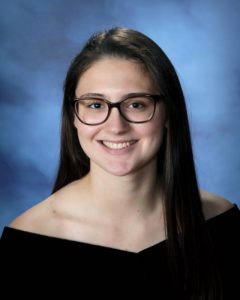 Greta Hermann, daughter of Todd and Suzanne Hermann of the town of Berlin has been named Berlin High School’s Class of 2019 Valedictorian. Greta has excelled in academics, starting an accelerated track in math and science in eighth grade. In eleventh grade, she earned the coveted Department Keys for Academic Excellence in Math and Spanish. Greta has taken eleven college level courses, including AP Chemistry and Siena College Physics. She will graduate with a NYS Regents diploma with Advanced Designation Mastery In Science and Honors. While managing challenging course loads and excelling academically, Greta is still able to volunteer her time as a Link Crew mentor assisting ninth graders at BHS. Furthermore, Greta is a talented musician, and has been an involved member of the music department since middle school. She has participated in drama club productions, jazz band, marching band, and All County band and chorus. During her senior year, she took on a new role with the BHS band instructor, as a guest conductor with the sixth-grade band. Outside of school, Greta serves as a lector at Saint Joseph’s in Stephentown and works at Grafton Lakes State Park in the summer. Greta demonstrated her leadership and serves as class officer, is a member of Super Troopers, National Honor Society and National Science Honor Society. She remains undecided about where she will attend college in the fall, but has narrowed her choices to Stone Hill College, University of Rochester or State University of New York at Geneseo. She is interested in majoring in Political Science/Music education. She attributes her success to the support she received from her family and teachers at Berlin CSD. 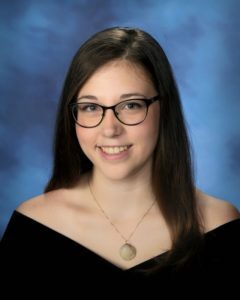 Hayden Crandall, daughter of William and Season Crandall of the town of Grafton has been named Salutatorian for the Berlin High School Class of 2019. Hayden is a talented student who not only excels academically, but also dedicates herself to various extracurricular activities and community service. She challenged herself through a variety of rigorous courses, including Advanced Placement level courses in chemistry and psychology. She will graduate with a NYS Regents diploma with Advanced Designation and Honors. Hayden has been a member of the girl’s varsity soccer team, the high school chorus, student council, Berlin’s National Honor Society and National Science Honor Society. This year, she was chosen to organize and run the American Red Cross Blood drives held at the high school and was elected by her peers as Class of 2019 President. Her strong organizational and planning skills have helped her in her rolls as co-chairman of the Prom Committee and as Yearbook Secretary. When she is not busy with school, she is busy interacting with young members of the community as a Youth 2 Youth member, as well as volunteering her time as a Link Crew mentor assisting ninth graders at BHS. She remains undecided about where she will attend college in the fall, but has narrowed her choices to Russell Sage College or Michigan State University. She attributes her success to the support she received from her family and the teachers at Berlin CSD.